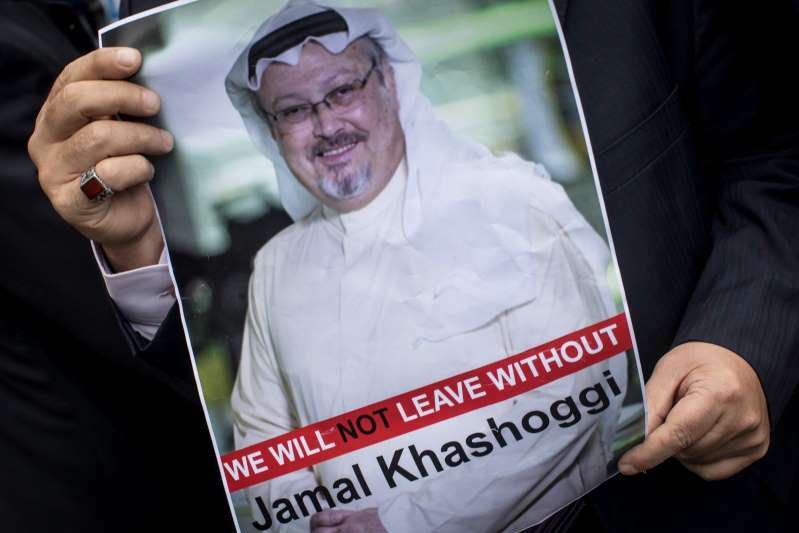 © Chris McGrath/Getty Images ISTANBUL, TURKEY - OCTOBER 08: A man holds a poster of Saudi journalist Jamal Khashoggi during a protest organized by members of the Turkish-Arabic Media Association at the entrance to Saudi Arabia's consulate on October 8, 2018 in Istanbul, Turkey. Britain and the US are considering boycotting a major international conference in Saudi Arabia after the disappearance Saudi journalist Jamal Khashoggi, the BBC has learned. Diplomatic sources have now told the BBC's James Landale both the US Treasury Secretary, Steve Mnuchin, and the UK's International Trade Secretary, Liam Fox, might not attend the event. A joint statement of condemnation is also being discussed by US and European diplomats if it is confirmed that Mr Khashoggi was killed by Saudi agents. The conference is being hosted by the kingdom's Crown Prince Mohamed bin Salman to promote his reform agenda. If neither Mr Mnuchin nor Mr Fox attend, it would be seen as a huge snub by two of Saudi Arabia's key allies. UN Secretary General Antonio Guterres earlier told the BBC that once it was clear what had happened to Mr Khashoggi, governments should decide how to react "in the appropriate way". Turkish TV has already broadcast CCTV footage of the moment Mr Khashoggi walked into the consulate for an appointment at which he was due to receive papers for his forthcoming marriage to Turkish national Hatice Cengiz.